It's been slim pickins in the L3 household for the last week. You may not have noticed because that's the beauty of blogging (thankfully). But make no mistake, it's been rough times foodwise in our nonline (non-online, get it?) world. We have resorted to breakfast-for-dinner on many days. Lunch has also been a truly dismal affair where yours truly has settled for ramen in a cup. You know things have reached a whole new low when your lunch comes out of a styrofoam cup. Oh, and I tend to get distracted while my ramen is in the microwave so more than once, the entire concoction has overflown in the microwave. So now, on top of everything else, I'm on the cleaning lady's hit list at work. By the time Sunday rolled around, we were both dying for a real meal. A few years ago, we would have shamelessly invited ourself over to the parents' house and sat around looking pathetic until they fed us but the move to a city with no family has led to the demise of our mooching ways. We are now forced to feed ourselves. This whole independence thing is definitely overrated! So, Sunday. I knew I wanted rice. Rice is my comfort food. During law school, I built many a meal around rice with soy sauce. I know, it sounds weird but there's something oddly comforting about slightly sticky rice, gently coated with a light layer of soy. The full sodium version. Don't wimp out and go for the low sodium stuff. It's not nearly as comforting. Trust me, I know. So, the rice was certain. The rest of the meal was a blank canvas. I started thinking curry but all of the South Asian curries I know how to make (all two of them) contain no vegetables. This is certainly not a problem on most days but today, I felt like I needed some vegetables in my system to sop up the gallons of sodium from my ramen cups during the week. A plan for Panang curry was hatched. 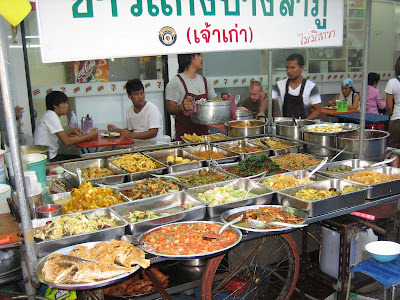 The hubster and I went to Thailand a little while ago and fell in love with Thai curries. Don't be fooled. The best thai curries are sold by roadside vendors, not in swanky air-conditioned restaurants. Most vendors have a couple of kinds of curry amongst many other items. The food goes quickly and is replenished often so you don't have to worry about how long it's been sitting there. 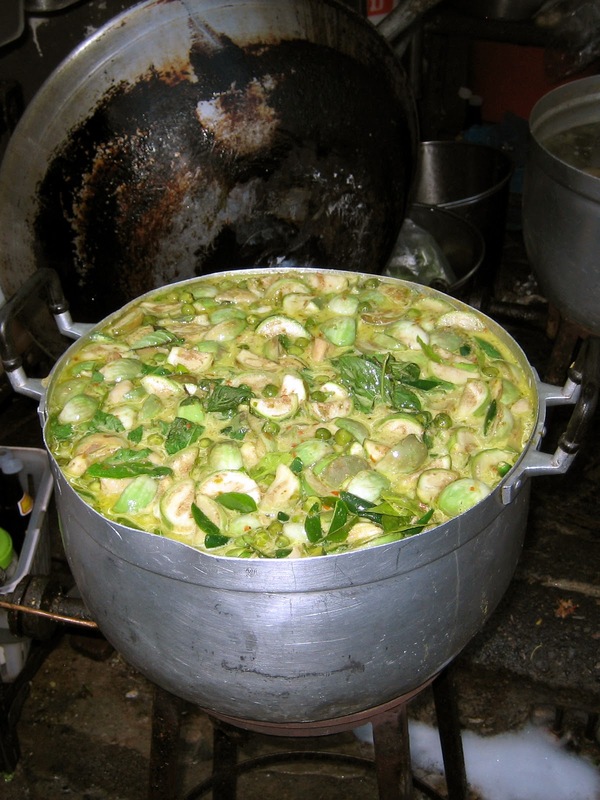 If you're lucky, you can even watch a vendor making a giant vat of curry. You can bet he's not measuring ingredients like three tablespoons of fish sauce or one cup of coconut milk. He has made it so many times before, he cooks by feel alone. Curry paste. Many foodies will swear you need to make your own but even in authentic Thai markets, the vendors will make you a packet of paste once you tell them what kind of curry you're making. Granted, each vendor has a different blend of spices but then again, so do different curry paste brands. Ideally, I'd love to make my own curry paste just like I'd like to milk my own cow, butcher my own meat, and grow all of my own vegetables but that's not feasible. Even the basil plant I was growing on my windowsill died a slow and painful death due to my neglect. So, I use a store bought curry paste. One that's made in Thailand. So there. You can feel free to make your own but note the ingredients listed require kaffir lime peel. I've sometimes seen kaffir lime leaves but never an actual kaffir lime so good luck with the making of your paste. Vegetables. I don't know if authentic panang curry even has vegetables but given that I'm using a curry paste sold in a jazzy, purple, plastic container, I recognize this curry is authentic'ish at best. All of the recipes I've looked at seem to contain meat only. I saw one that used frozen peas and another that used potatoes but I figure you can use whichever vegetables suit your fancy when making your authentic'ish panang curry. 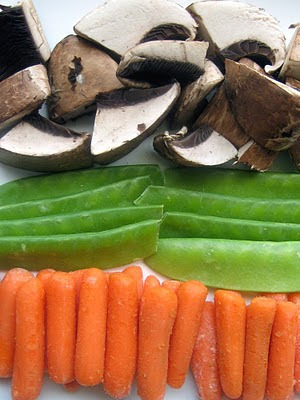 For the record, I used mushrooms, sugar snap peas, and carrots. I served the pot of goodness alongside a steaming pile of Mahatma's jasmine rice. Yup, Mahatma. The company with the turbanned caricature holding a wand on each bag of rice. I don't know if I should be offended or impressed. Either way, he packages a mean jasmine rice so I'm in. The website tells me it's imported from Thailand. I wonder if "authentic" Thai rice brings the authentic'ish curry up a few notches on the authentcity Richter scale? The upside was that the curry was truly delicious. Warm, fragrant, and comforting. The downside? The hubster and I finished the pot which only means one thing. It's a good thing we like pancakes because there will be more nights of breakfast-for-dinner in the upcoming week. Lightly brown onions and garlic in oil. Move to blender, add a bit of water or chicken stock and puree the heck out of the mixture (this helps ensure a smooth curry). Add a bit of coconut cream (the top part of the mixture in the can of coconut milk) and sautee the curry paste. Add the fish sauce, brown sugar, and onion/garlic puree. Cook until mixture is fragrant and oil begins separating. Add the remaining coconut milk and stock and cook until the curry reduces by about a quarter (you just want to burn off some of the liquid and concentrate the flavors). While the curry is cooking, feel free to add your veggies at any time (for example, the carrots would go in first because they take longer to cook. The peas and mushrooms closer to the end). Salt and pepper your chicken. In a separate pan, heat a spot of oil and cook the chicken until almost cooked. Add to the curry and cook the a few more minutes until chicken is cooked thoroughly (I cook my chicken separately because I like the slight browning. You can definitely just add the chicken in with the veggies and cook it with the curry as well). Top with a chiffonade of basil or kaffir lime leaves (I didn't have either so I skipped this step and the curry was still darn tootin' awesome). I love how you are on your housekeeper's hit list...I am too but not because of the microwave! I think mine is annoyed with me because I always drop things in the toaster oven. Have a fantastic Monday. Love your humor, btw. Breakfast for dinner sounds so good, although having it every night of the week could get tiring. This curry sounds incredible. Thank u for stopping by "Tasty Appetite" n giving my sweet little space your precious time. Hope to see you often. This looks delicious!.It is wonderful when a dish is so good that you polish it off...but then also sad when you don't have any leftovers. This looks fantastic. And I love that shot of the huge kettle of curry! I am now totally hooked on to malaysian, thai and chinese food...solely cos of the various pastes and sauces available..it just makes life so much more easier..
Great, just had lunch and now I am hungry again. Love curries but not familiar with panang curry paste. Will have to check it out! I totally agree to get the best food is to get it from street vendors!!!! Guess what!? I'm working on my post about curried chicken too hahaha. We're on the same food craving mindset! Where do you do your ethnic shopping around here? Dish looks yummy! Can't wait to try! That looks so good! I love curry, but no one else in my family does, so I have to enjoy it vicariously in blogland. I'm having breakfast for dinner tonight, I feel ya. You are right about store bought curry paste...it's actually pretty good! Yum yum yum yum YUM!!! Love Thai food - it's such a gorgeous cuisine so jam packed with aromatics that even the commercial stuff in jars tastes pretty darned fabulous!!! 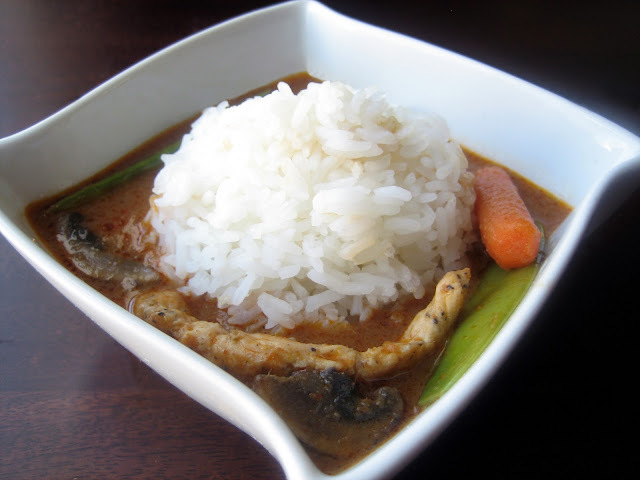 Love the look of your curry, especially with the mound of rice in the middle! Thai curries are the food of gods! Your story about being in Thailand made me so jealous... I haven't been there yet and would definitely love to go there for a visit and some spicy curries! I love your pictures! and the recipe looks wonderful! I know what you mean, my week has been filled with leftovers and Chipotle. Good weather/work/chores have taken over the past few weeks and it has been difficult to post. Love curry anything and will try this soon! First of all, I'm totally with you on eating rice with soy sauce and getting complete satisfaction from it. Secondly,I'm totally with you on buying authentic curry paste. I looked into making my own curry paste but also surrendered when I saw kaffir lime peel listed. Your curry looks delicious and I love how doable it is. Very mid-week friendly. Love curries of all kinds this post has me hungry now ! Kait- Hard to believe I'd get tired of cereal and eggs. Maybe I just need to expand by breakfast repertoire! Monet- No leftover is definitely sad. Katie- Thanks! Giant pots of food are good preparation for the week. An Open- I'd love to know of any good Chinese pastes you've found. All the oness I've tried are too "fake" tasting. Tanantha- Great minds think alike! I didn't know you were Thai! That explains your beautifully vast collection of Asian-inspired recipes. Hungry Scholar- Whadya have? I personally like eggs and b'fast potatoes best. The combination almost feels like a real meal. Denise- You're right! I love that Thai food doesn't try to mute strong flavors. WannaFoodie- Wonderfully restorative is such an apt description. I will use it more often! Kat- It's fun when good weather prevents you from posting. Not so much when it's work. Oh, and Chipotle is delicious! Val- I'm glad you surrendered. I would've felt slightly bad if you had said, "*Gasp* You don't make your own curry paste?" Delicious! I love your pics from Thailand as well. Thai has to be one of my favorite cusines! I'm always adding vegetables where they don't belong. I can't see anything wrong with it if it tastes good. My husband always says "curry isn't his first choice" so I only eat big bowls of it when he's not around. I love Panang curry, and I'm totally addicted to the one we get from "Siam Noodle and Rice" on decadent nights that cry for delivery. 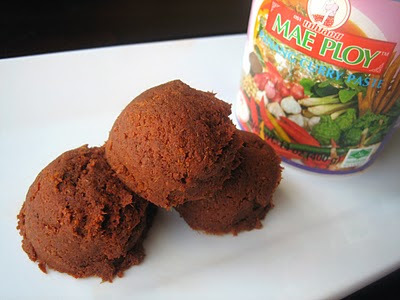 I'll have to try Mae Ploy's paste (I've only ever done their red curry paste).